Retirement risks such as longevity, stock market volatility, income taxes, combined with inflation, have placed a greater responsibility on Americans to save for their future. With this greater responsibility comes a need for financial solutions that can help provide a new level of protection for retirement savings. Hi. Welcome to another episode of Money Script Monday. My name is Brian Manderscheid. 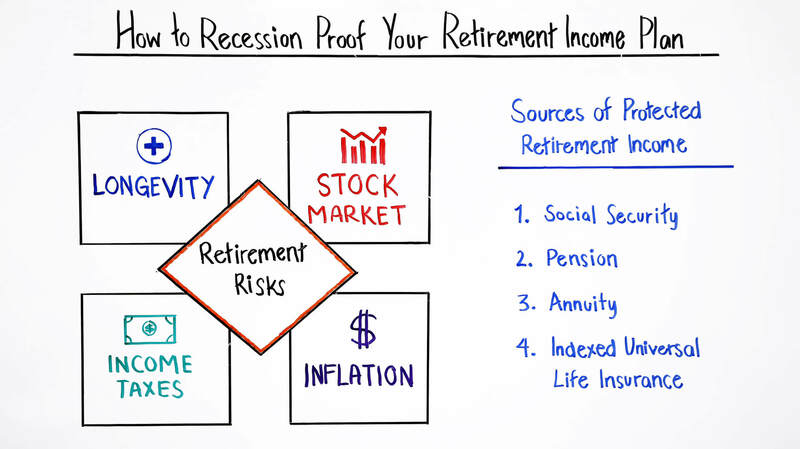 Today I want to present how to help recession proof your retirement income plan. While it's impossible to predict when or how severe the next recession will be, we can take a few practical steps today to ensure a happy and successful retirement. What I want to do today is talk about the four major retirement risks, talk about the four sources of protected income, and talk about the retirement income shortfall analysis. Which is a report that we can offer to help reduce these risks and maximize your sources of protected income. 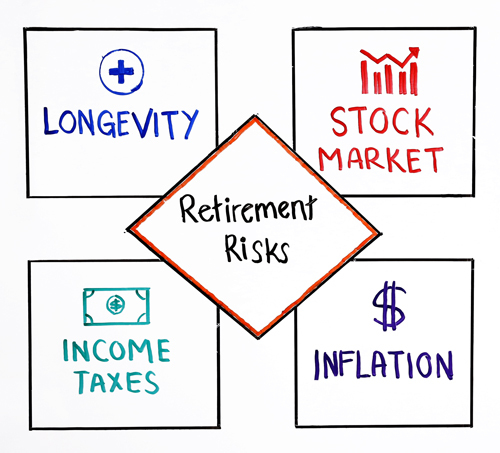 There are many risks associated with retirement, but the four we want to highlight today are longevity, stock market, income taxes, and inflation. Now, if your retirement plan has very little protected income and relies heavy on asset or account withdrawals to meet your retirement income needs. You could potentially run out of money too soon or have to reduce your retirement income consumption. 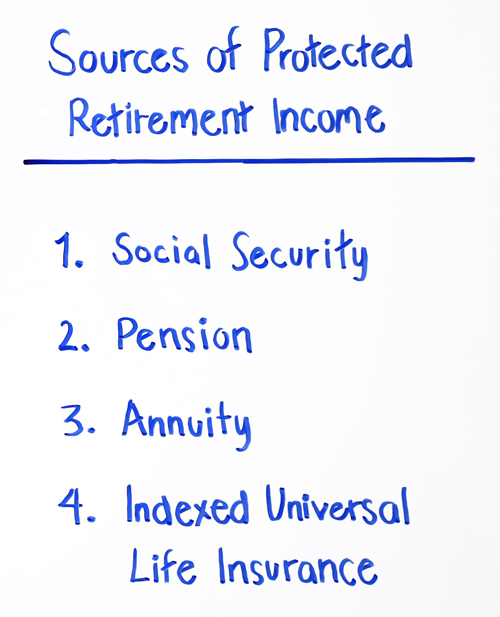 The four sources of protected retirement income are social security, pensions, annuities, and index universal life insurance. One of the goals of our planning process is to maximize protected income so that it is equal to your essential expenses, which are the needs that you absolutely have to have covered in retirement. By doing so, we can reduce the risks associated with retirement and again help you enjoy that happy successful retirement. What I want to do now is jump to the screen to review a sample version of the retirement income shortfall analysis. Now that we addressed the four retirement risks and the four sources of protected income, I'd like to introduce the retirement income shortfall analysis. We made it easy to receive a custom and holistic retirement income plan incorporating all of your income sources and assets. Our primary goal of this report, and our planning process, is to customize a successful retirement income plan by minimizing the effects of the four retirement risks and maximizing the four sources of protected income. All we need to produce a custom retirement income shortfall analysis for you is a two-page wealth assessment form which you can request today. What I would like to do now is go over the sample case scenario, page by page, so you know what to expect when you receive a customized retirement income shortfall analysis from your advisor. The next page provides a table of contents. As you can see, it's only an 11-page report. While it's holistic and complete, it's not going to overwhelm you like some other financial reporting softwares may do. Next, I'm going to go through each page individually for this sample case scenario. The overview is probably the most important page in this entire report. Since there's a lot to go over, I'd like to tackle this page in sections. The top section of the overview page calculates a probability of success for both the current scenario and the recommended scenario. To do this, we run a Monte Carlo simulation 1000 times for each scenario analyzed. If there are enough funds to last through the entire retirement scenario, then the retirement scenario is marked as a success. The percentage is the number of successes out of 1000. If the retirement success probability score comes in between 0 and 49, the plan needs attention. Meaning, you have less than a 50% chance of your plan being successful. If the retirement success probability score comes between 50 and 74, action would be needed in order to steer back on track. If the retirement success probability score comes in between 75 and 100, the plan is on track and has a high probability of success. Our goal is to help you obtain a 75% or better retirement success probability score. In this sample case scenario, the current scenario only has a 43.5% score and needs attention. However, with our planning process, the recommended scenario has an 89.1% score and is well on track. The next section of the overview calculates the retirement success probability if you and your spouse live 10 years past life expectancy. As you can see, the score drops substantially in the current scenario and holds up strong in the recommended scenario. We calculated the protected income percentage of a desired income, which is the percentage of protected income during retirement. In this sample case scenario, the current scenario only has a 28.4% protected income percentage. This means roughly 28% of the desired income is being covered through protected income sources. The additional 72% of the income need will need to be satisfied by asset withdrawals. The recommended scenario has almost a 69% protected income score which should cover all of the essential income needs. The 31% of desired income or discretionary income needs would be made up through asset withdrawals. Lastly, the assets remaining at life expectancy are over double in the recommended scenario. This would allow you to either leave more behind or spend more while alive. Continuing on the overview page, we then take a look at the total lifetime protected income. Going down line by line, the cumulative social security income is higher than the recommended plan as we chose to select the optimal claiming strategy. Neither plans have company-provided pensions which is pretty typical in today's retirement landscape. Our recommended plan has over 1.6 million in cumulative annuity income, which is generated from a $300,000 FIA (Fixed Index Annuity) deferred 10 years; more on that later. Of course, $0 of annuity income in the current scenario. We lump in cash value life insurance in the total lifetime protected income as it does provide tax-free protected income, meaning the income is exempt from future taxation. With the recommended IUL redirecting $40,000 a year of savings for 10 years, we were able to conservatively generate $38,000 a year of tax-free income. Again, we'll review the recommendations in further depth as we move along. To sum it up, we generated roughly $4 million in total protected income with a recommended scenario versus 1.8 million with a current scenario. That is an increase of 2.5 million or 142% more protected income in the recommended scenario. Finally, to wrap up the overview page, let's take a look at the graph of the desired income and total protected income. With the current scenario, the plan is heavy in account withdrawals and very little protected income and no tax-free protected income. Looking at the recommended scenario, the plan provides a strong base of protected income that keeps up with inflation, tax-free protected income to hedge against future tax rate increases and account withdrawals to cover discretionary income needs. We believe this is a powerful visual to emphasize the need for protected income in your retirement plan. Page four is an overview of the four major risks, longevity, stock market, income taxes, and inflation. We covered these risks earlier in today's presentation, so I'm not going to go through each of these individually. This is a good time to ask yourself how you or your current financial advisor plan for these risks in retirement. Additionally, one or more of these risks may be more important for you. It's important to talk to your advisor about what keeps you up at night so we can customize a plan tailored to your needs and goals. Lastly, it's a good time to remind you that with our planning process, one of our goals is to minimize these known risks rather than trying to simply earn you a better rate of return. Page five goes in depth into the need for protected income as well as the three sources of protected income we reviewed today. As mentioned, we also included index universal life in the protected income category because of its tax-free protected income nature. One of our goals in our planning process is to maximize your protected income so it meets your essential expenses, which are the needs you absolutely have to have covered. This allows you to minimize the four retirement risks and allows you to have a happy, successful and stress-free retirement. Moving on to page six which is the summary of the current scenario. While some of this is review from the overview page, it's worth reviewing so you know what the results look like if you stay on their current path. There are three questions at the bottom right-hand corner worth asking yourself regarding your current scenario. 1. Are you comfortable with the probability of success? 2. In the steady return scenario, do you end up running out at retirement funds? 3. In the steady return scenario, are you happy with the total retirement assets you are left with at life expectancy? This is a good time to check in and make sure you understand what the implications may be if you don't take any action. Page seven is a more detailed ledger breakdown of the current scenario. Keep in mind the assumptions used in the sample case scenario are of course all customizable. A few things I would focus on when going through the ledger. Number one, the only current source of protected income in this sample case scenario is social security. The protected income percentage located to the right of the protected income is low and likely will not come close to covering the essential expenses. The withdrawals from other accounts make up a large majority of the desired income and once both spouses have turned on social security, the withdrawal rate they're taking is well over 6% which is higher than the 4% recommended withdrawal rate. While this couple doesn't run out of money in this plan, they are highly susceptible to the four retirement risks we outlined previously. Next, on page eight, we can see the summary of the recommended scenario. While it's again a little bit of a review of the overview page, it does help you understand the idea of protected income. Also again, it's important to note that we are able to achieve a high retirement success probability score by taking less risk, not by trying to time the market or trying to achieve a higher rate of return. Just like we did with the current scenario, on page nine we provide a ledger breakdown of the recommended scenario. The difference is our plan has much more protected income as well as a much more reasonable asset withdrawal rate once all the sources of protected income begin. In the recommended scenario, I'd like to point out all the things that we changed in this retirement income plan. First, you can see that we recommended the higher wage earner delay social security to age 70 rather than taking that full retirement age. Second, I want to point out the joint life annuity income that begins when this couple retires. There are many different types of annuities in the marketplace, which all have their unique pros and cons. It's important to work with a qualified independent adviser who can look out for your best interest. Third, let's take a look at the tax-free protected income from the IUL policy of 38,000 per year. You'll notice after age 85 which is assumed life expectancy for the husband, the IUL income stops. At that point, the death benefit pays out and the proceeds are funded into the investment account balance and since the surviving spouse loses her social security benefit and steps up to his when he passes, the life insurance death benefit is a welcomed financial relief. Again, there are many types of cash value life insurance. We generally recommend IUL. Of course, structured with the minimum death benefit and funded up to the internal revenue code guidelines in order to lower policy costs and maximize cash value growth potential. Page 10 is also a critical page to review. This allows us the opportunity to outline the specific steps of our recommendations as well as for you to ask questions about the specific recommendations and get into further detail. In this sample case scenario, we made the following recommendations. Step one: Roll over 300,000 IRA into an annuity providing guaranteed joint life income after 10 years of deferral. Step two: Redirect $40,000 a year of annual savings into an IUL policy to provide tax-free protected income. Step three: Reposition the $200,000 brokerage account into life per asset management for upside growth potential. This allows us to talk about next steps as well as to schedule any follow-up appointments necessary. We want you to feel comfortable with these recommendations. We want to make sure that you have all the information needed to make an informed financial decision. And finally, what report wouldn't be complete without the appropriate assumptions and disclosures. Again, keep in mind all these assumptions can be modified. The disclosure basically states that this report is reliant on the data provided and does not serve as tax or legal advice, but rather as a resource to provide a stronger financial plan. 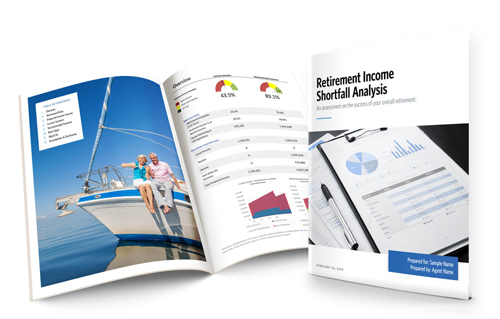 I hope after seeing the retirement income shortfall analysis from start to finish, you can see how the support can help you properly plan for a successful and stress-free retirement. To summarize today, we talked about the four major retirement risks, the four sources of protected income and we reviewed the retirement income shortfall analysis. What I'd like to do now is to extend an offer to receive a custom retirement income shortfall analysis for you. All you have to do is use the information on my page to request one today. Thank you very much. We'll see you next time. The monte carlo simulation uses a random value from the normal distribution each year, for each simulation, with the investment account return and investment standard deviation in the key assumptions provided from the individual. This randomized annual return then gets factored in to the current investment account balance. The standard deviation used in the assumptions was calculated from past market performance. Past performance is not indicative of future results. 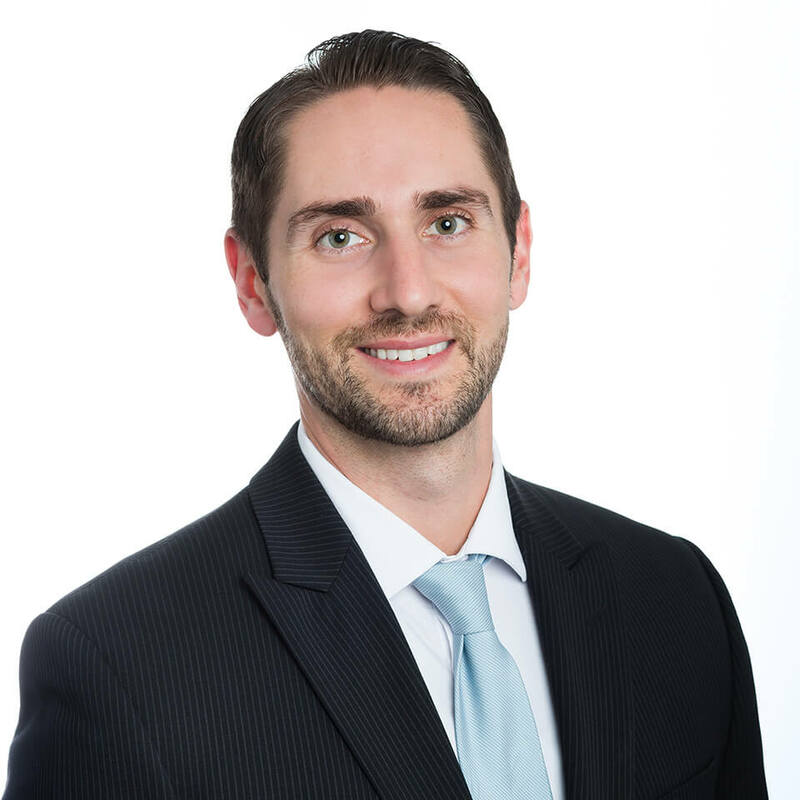 Brian Manderscheid is the Vice President of Case Design at LifePro. He works with financial professionals designing advanced case illustrations that are built for longevity and are always in the best interest of the client.